1. Preheat the oven to 160˚C, gas mark 3. Heat the butter in a small saucepan and, when foaming, add the shallot. Fry gently for 6-8 minutes until soft. Take the pan off the heat and stir in the crab, lemon juice, mustard, Worcestershire sauce, honey, chives and 2 tbsp double cream; season. 2. 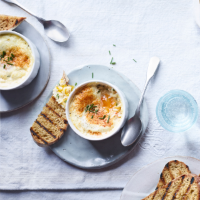 Divide the crab mixture between 2 ramekins or small, individual heatproof baking dishes. With the back of a spoon make a dent in the middle of the crab mixture; crack an egg into each. Spoon 1 tbsp cream over each egg, season and sprinkle with a dash of cayenne pepper. 3. Put the ramekins on the middle shelf of the oven and bake for 15-20 minutes, until the whites are starting to set but still a little soft. Remove from the oven and allow to cool for 2 minutes. Sprinkle with more chives and serve with the rye toast. This recipe was first published in Thu Mar 28 13:40:36 GMT 2019.